A calendar is a system of dividing and recording time. Calendars come in many different varieties; including astronomical-based calendars, Gregorian, Hebrew, Islamic, Indian, Chinese and Julian calendars. As different as they all are, the one thing that calendars have in common is that they all recognize two great natural divisions of time: the day and the year. Both the day and the year are based on the earth's relationship to the sun while the month is based upon the changing appearance of the moon in the sky. The week however, is not based on any natural event, but is entirely a man-made division of time. In 1987 it was estimated that forty different calendars were in use in the world. 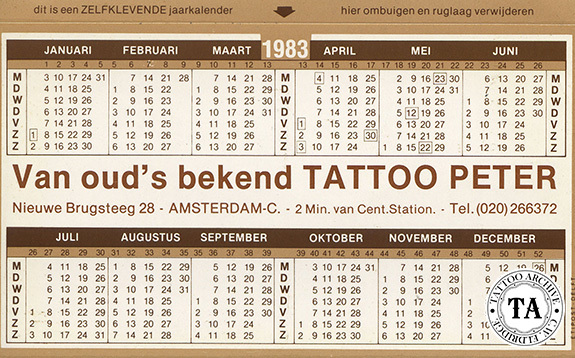 In the tattoo world, calendars have been used in many different ways. They were often pocket sized and sometimes seen printed on the backs of business cards. The thinking was behind this it was good advertising as a person would keep the calendar/business card all year and perhaps show it to a friend. 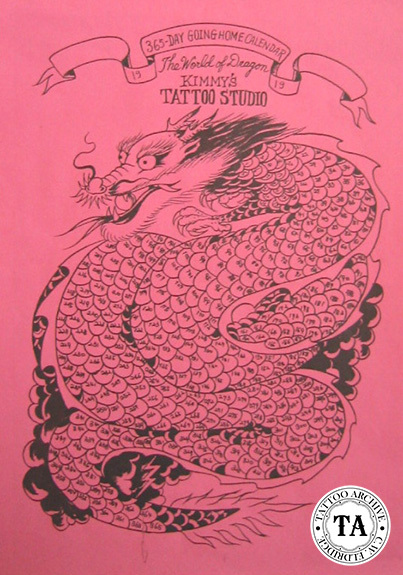 Many shops would create their own calendars or date books using their artwork or photographs of their tattooing. 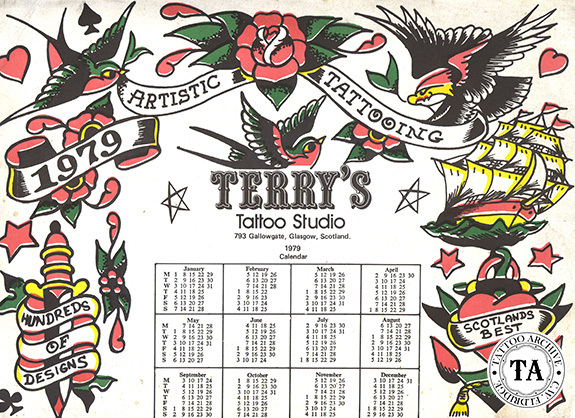 Of course many companies are able to produce personalized calendars to suit their customers and tattoo shops will give these away in the New Year as promotional items. Being ex-navy, one of my favorite calendars was the "short-timers calendar." This calendar is used as a countdown for the last year of active duty. Each day would be ceremonially marked off until that blessed day arrives! Paul Rogers had a special love for calendars. He would buy the ones with the large spaces for each day and would keep a running diary of events that happened; like who visited him, the weather, things that he got done and places he went. In this way, he could look back on his calendars and relive the memories they held. 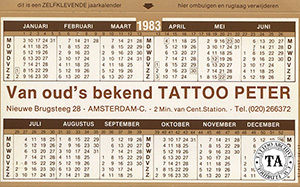 The Tattoo Archive produced a calendar 1979 as its first item being offered for sale. Unfortunately the calendar was not a great success, as I am still selling them today. It was, however, a good lesson that timing is everything. I learnt that very few people want to buy calendars after the turn of the year.